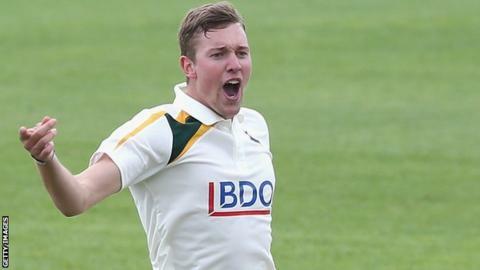 Director of cricket Mike Newell believes the emergence of Luke Wood and Jake Ball will give Nottinghamshire a strong bowling unit this season. Debutant Wood, 19, and Ball, 24, claimed four of the 10 wickets in a rain-affected draw against Hampshire. "We've got two young, local boys in our attack. We're strong in that area," Newell told BBC Radio Nottingham. "We've got competition for Luke Fletcher and Harry Gurney, and Andrew Carter will come back from his loan." Ball took 18 wickets in 12 appearances for Notts last summer after making his debut in April 2014.